“Кто ходит в гости по утрам, тот поступает мудро…” (He who goes on a visit in the morning, act wisely…) sings the silly little bear in a popular cartoon for children. 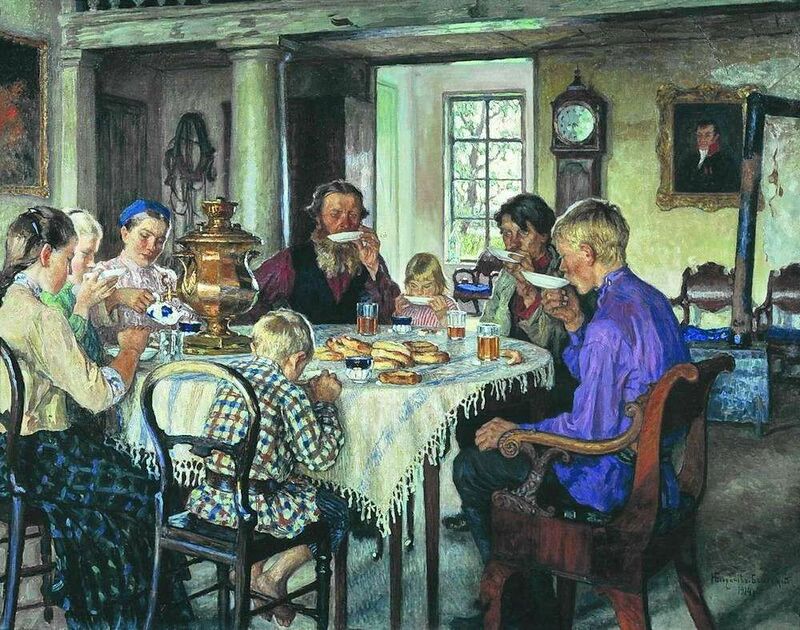 Actually, lunch or dinner is a good time to visit any Russian home. Russians love having guests and try to welcome them as well as possible, to entertain and treat them, insisting for close friends to spend the night in their place. 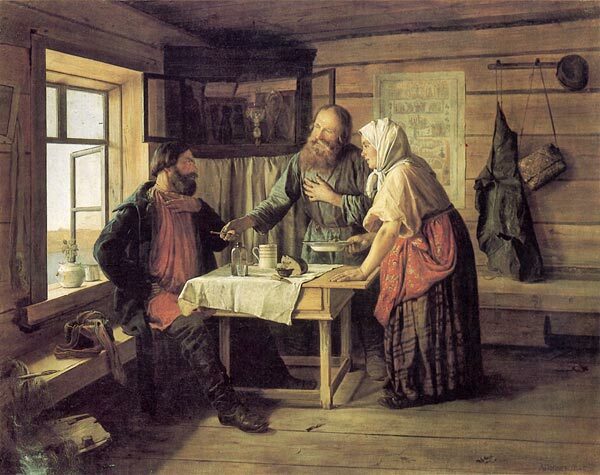 There are many Russian proverbs and saying about hospitality reflecting the history and traditions of our people. “Гость в дом, бог в нем” (Guest in a house brings God with him, meaning he brings happiness). “Гости во двор, ворота на запор” (Visitors in the courtyard, the gate must be locked, as a way to keep them longer). “Гостей напоил, накормил, спать уложил” (Guests need to be refreshed, fed and kept for the night). “Что за обед, когда гостя нет” (What to prepare for dinner when there is no guest). “Умей у людей погостить и к себе пригласить” (Know how to be a guest and how to receive them). “Без соли, без хлеба худая беседа” (Without salt, without bread, there is no conversation possible). Russians love to entertain, and happily prepare a lot of different appetisers, salads, soups, because without a soup a lunch is not a lunch. For dinner, they will serve meat, poultry or fish with different side dishes. Each housewife has her own recipe. At the end of the meal, you will be served tea. Coffee is usually drank in the morning, so it is not appropriate to offer it to guests. Many housewives bake their own cakes and pies, remembering that “Пироги на столе – уваженье гостю” (Pies on the table is a respect for the guest). It is not well perceived to refuse the refreshments offer by the hostess, it will offend her. After all, she cooked the meal, waited for her guests, made up the menu, tried to surprise the visitors and treat them the best she could. The best compliment for the hostess is when a guess ask her for the recipe of one of her dish. Russians don’t like buffets, as well as long conversations before sitting at the table or during the aperitif. When receiving guests, Russians like to invite them directly to the table. If anyone happens to be late he will have to drink down a “penalty glass of wine or vodka”. Russians drink quite a lot and always with pleasure. Each drink is accompanied by a toast, followed by the clink of glasses (in ancient times, by clinking your glass with a guess and pouring few drops of your drink into the other person’s glass showed your respect for the guess and the certainty that there was no poison into the beverage). An invitation is rarely made more than a week before the chosen date. Written invitations are only sent for a wedding. For informal invitations, a phone call or an oral invitation when meeting is enough. 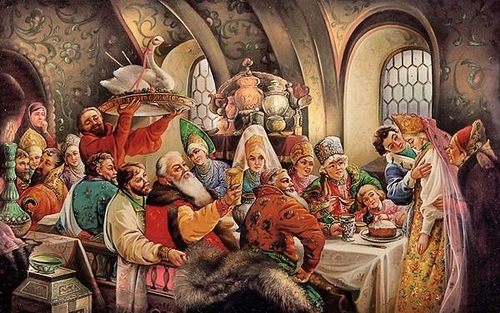 It is not a good idea to arrive somewhere without being invited as “Незваный гость – хуже татарина” (an uninvited guest is worse than a Tatar, meaning than Tatars were enemies of the Russian people). “Незваные гости гложут кости” (Uninvited guests gnaw the bones, to them no food would be served). Guests never come empty-handed. For a birthday or a wedding, of course, a gift is obligatory, otherwise, a bunch of flowers for the hostess, sweets for the children, and a bottle of wine for the owner that will be immediately put on the table. the individual lessons Russian learning you will be able to ask all the questions, remained from the group classes, discuss with the teacher your homework and fill all the gaps in the Russian language knowledge you have ever had. But everyone remembers “В гостях хорошо, а дома лучше” (It’s good to be a guest, but it’s better at home). Guests all leave one after another, taking with them a piece of cake and the remembrance of a pleasant moment.